I thought it a good idea to go outside and paint en plein air this afternoon. After all, the Jeep thermometer registered 66 degrees. What it didn’t register was the slashing, freezing wind that cut through my layers of shirt, sweatshirt and denim jacket as I sat on the courthouse lawn in Waxahachie and tried my hand at the historic Rogers Hotel and Zulu’s Coffee House. After about an hour of drawing, I gave up and returned home. Using the photos from my digital camera, I worked at laying in some of the ground colors and rendered a few details with a fine brush. The salt kind of got out of control, and the side of the building looks quite funky, but I can obliterate those patterns if I choose. I’m glad I got out today, but regret the cold, cold climate. Regret even more that I still have Art History to finish up for tomorrow and it’s getting late. Looks like I’ll have to put the watercolor on hold. I hate that. This one looks like it’s going to be fun to do. In yesterday’s post, I mentioned a day without painting (too many chores and errands to do), and the day before, a painting that started out not-too-promising. Here it is. I only post it to prompt myself to have something to show for today by day’s end. I’m saddled up with another pile of tasks (grading, preparation for three classes–Art History, Advanced Placement Art History and Logic) and a few household chores. But it is gorgeous outside as I write this (47 degrees but incredibly bright, sunny and the promise of warming up as the day progresses), and so I’ve determined that I will get outside and paint en plein air. My wife comes home from riding around noon, and then has to work in the public library will 5:00 (bummer), but I will get out into the sunlight when she leaves for work, and put in a minimum of five hours while she does the same. Thanks, all of you who read and follow my blog posts. I assure you (as well as myself) that today will be a day of artistic production. I already look forward to posting tonight. I hope all of you artists find the time today to create as well. I love one of the opening lines from the motion picture The Emperors Club–the teacher, in his senior years, declares that he is only certain of two things. One of them is–days that begin with rowing across the lake are better than days that don’t. The other–a man’s character is his fate. I hold to both of those principles–(for me) days that involve creating art are better than days that don’t, and . . . my character (as artistic) is my fate. Thanks again for reading. Talk to you later . 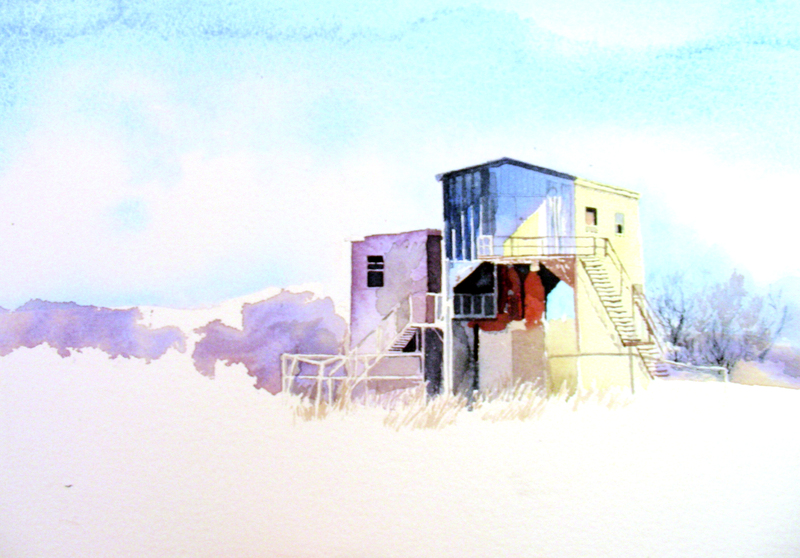 . .
My alternative 9 x 12″ watercolor of the train structure took a lousy turn. Composition collapsed. Don’t have the courage to show it, and wonder now if it can be rescued. Probably will lay it aside a few days minimum. Did not get to paint yet today–helped an artist friend from Boston move into his new apartment here in Arlington, Texas. Pretty exhausted now, having run several necessary errands after the furniture hauling. Perhaps tomorrow I’ll be rested enough for a fresh start. 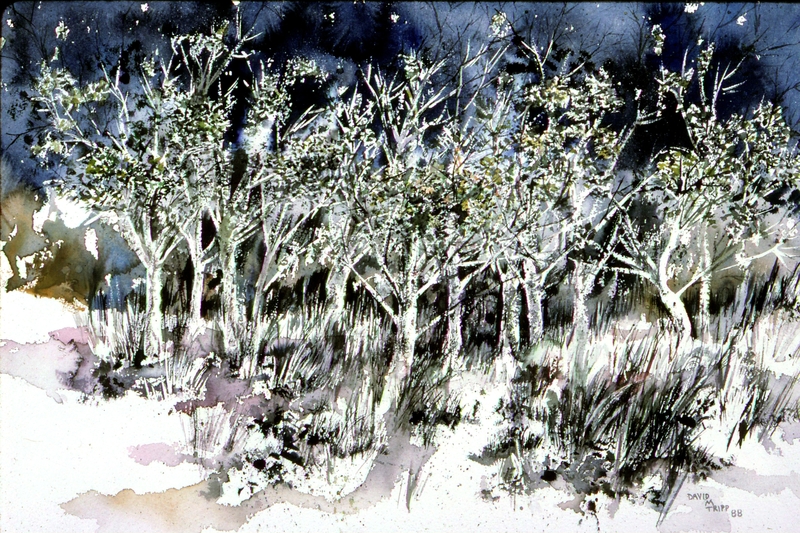 At any rate, from my archives now I pull this old watercolor from 1988–one of my first attempts at using Winsor & Newton masking fluid, so I could make the tree limbs and leaves of a thicket stand out white against a night sky. Also an early attempt at dry brush on the ground cover. Thanks for looking . . . I cannot believe I posted such a bad, out-of-focus photograph earlier today (just after midnight–maybe that had something to do with it!). At any rate, I worked some more on this watercolor, and this time managed a more focused, balanced shot of it. Everything from the prior post applies here. I’m still loving it, enjoying the exploration of color, and hope it turns out O.K. 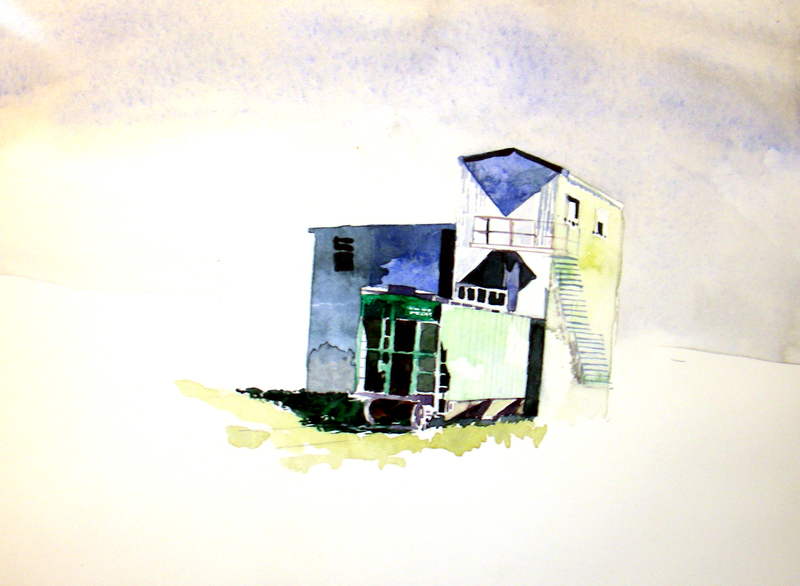 I started another, smaller composition of this same watercolor today as well (a 9 x 12″) and inserted a green 3-bay hopper partially emerged from the building. The sky on the smaller one is much more wintery (like today’s sky was). I’ll post it when there is more to show (maybe later today/tonight). Three days ago, while returning from the gallery, I took an alternative route home, and was stunned to see this abandoned railroad site just east of the historic Handley neighborhood in east Fort Worth. The afternoon sunlight and emerging shadows reflected a gorgeous yet chilly winter day, and I couldn’t resist pulling the truck over and making some preliminary sketches, then snapping a few shots with my BlackBerry. I’ve only gotten to make two passes over it, late in the night, the past two nights. Finally, just after midnight, I decide to go ahead and post it. I’ve had a fetish for railroad scenes since I was a small boy playing with Lionel trains and going with Mom and Dad to pick up Grandmother at Union Station in St. Louis. I’ve drifted away from railroad settings in watercolor but hope to get a few more in now. 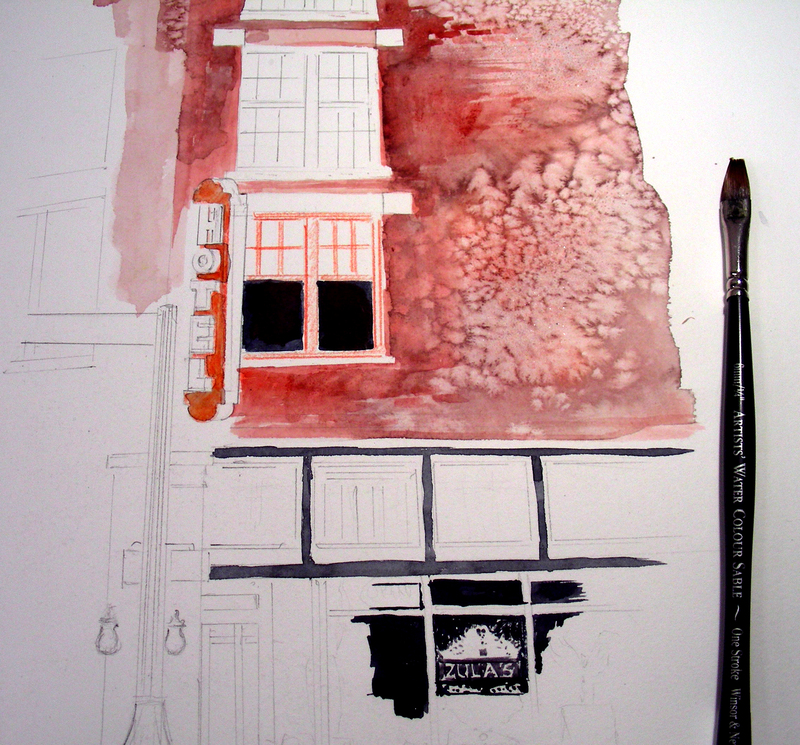 Today I did not begin to watercolor until now (10:16 pm). Too wiped out from school responsibilities, I retired to bed for a late-afternoon/early-evening nap, then spent the evening doing tasks. Now that I’m getting around to watercoloring, I realize there will be nothing in that media to post tonight, so I’m bringing out one of my hundreds of greeting card designs that I sell out of my booth at art festivals. Charles Dickens has been a favorite among buyers. 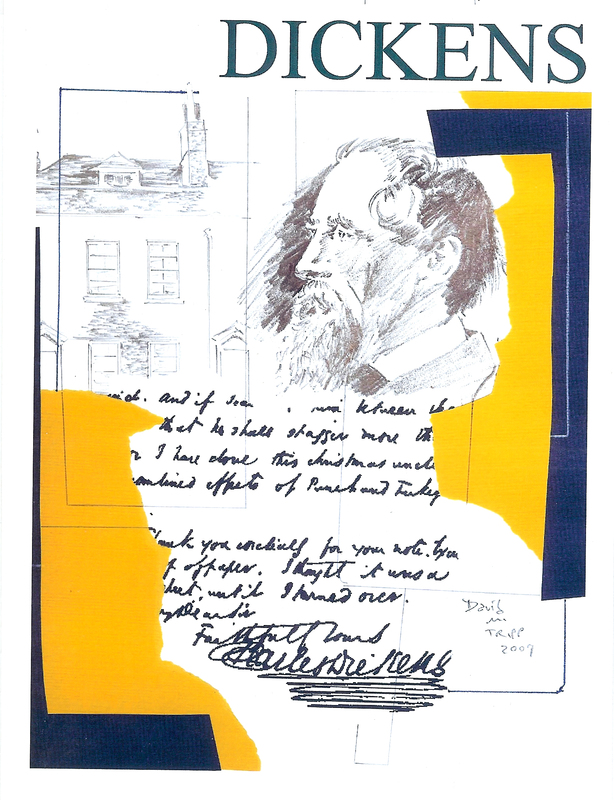 The pencil sketches are mine, the handwriting sample of Dickens came from Google, and color was added with cut and torn pieces of Canson paper and a prismacolor pencil. Collaging and watercoloring often competed with each other for my quality time and attention, and for awhile they competed fiercely in my booth sales. Watercolor finally emerged the victor, and now I very seldom work on collage, though I always enjoyed the process immensely. I wonder if I’ll ever go back and pick it up again–there just seems so little quality time to make art these days, and so little energy left when I finish school daily. I’m closing in on the end of this one. I almost threw it away last summer, it started so badly. I began the composition in plein air. Rainstorms throughout the morning, followed by hot sun at noon meant that soon my hand was sweating all over the watercolor paper. So I took some pictures, went home, looked at the painting, hated it, and laid it aside for a few months. I think it’s finally showing some possibility as I continue to tinker with it. This painting could have been finished today, but I laid it aside to start a new one at a railroad facility. I found an old, old structure where hoppers used to pull through and fill up from storage tanks overhead. I have the sky finished, and the structure sketched in. I cannot make up my mind whether or not to park a hopper inside the station. Hopefully I’ll have enough of it in progress to post tomorrow. I got so excited that I blogged about this without a picture (I was at school and without the proper technology). 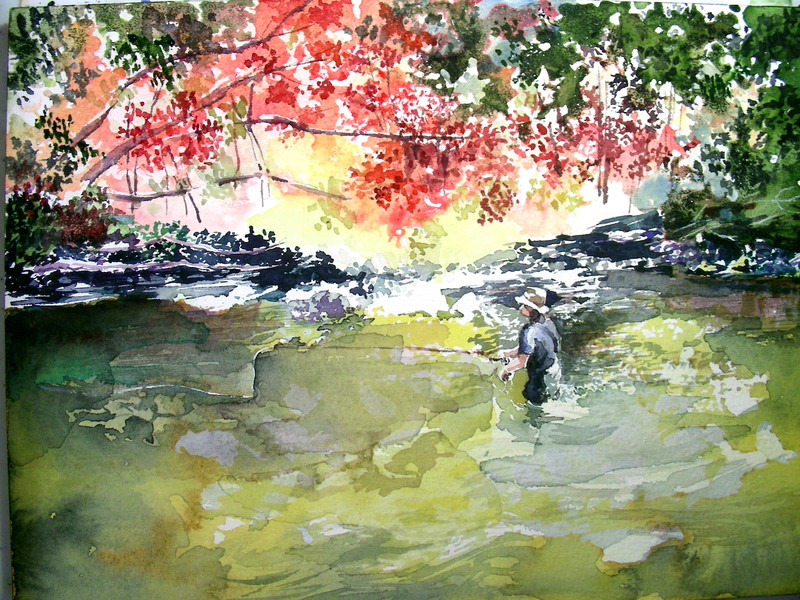 I don’t know how well this is going to show up, but I was inspired this morning while looking through a catalogue of a show I saw a few years ago featuring Winslow Homer’s watercolors, titled: “Winslow Homer: Artist and Angler.” He frequently painted those very subtle ringlets of water disturbance where a trout just rose. I decided to insert several of those in the deep pool at the left, and then put the shadows of the trout beneath the ringlets. 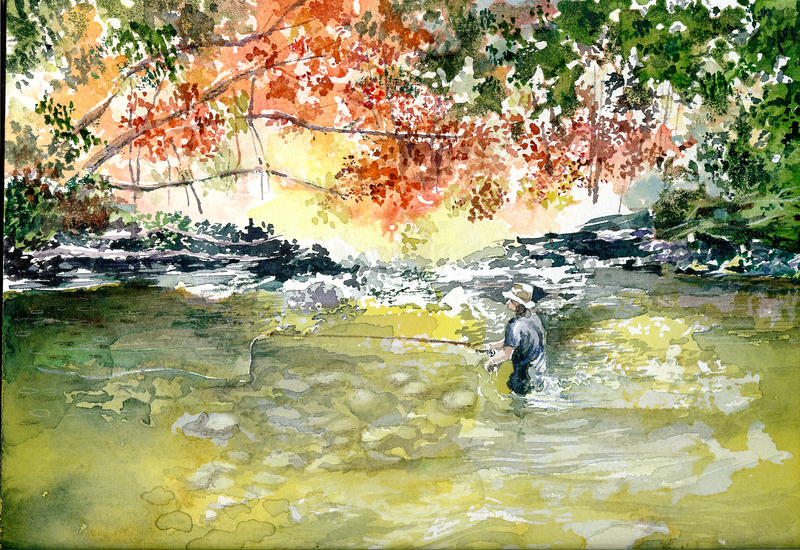 I’ve always been excited to watch this while fly fishing in Colorado, and finally got around to attempting to depict it in watercolor. February 23, 2010–no picture yet, but it will be coming! Sorry to post prematurely, but I’m stuck in a high school for the day without picture-posting technology. Just wanted to say that I’m having fun with this fly fishing watercolor that I thought I was finished with last night. Taking a page from Winslow Homer, I’ve put some very subtle circles in the water surfaces, indicating trout rising in the dark, deep pools, and have put shadowy glimpses of the trout beneath the surface circles. I have always delighted at the glimpse of these while fly fishing in Colorado, and admired them in the Homer watercolors. Somehow I forgot to do this with mine–till I got to school early this morning and had some time to tinker with this piece. These are very subtle details, and I’m not sure just yet how the camera will pick them up. But I’ll see what I can do with the photography when I return home this evening. I promise to post the picture then (or at least some closeup details of the deep pools). I think I’ve done all I can with this one. I only spent a few days on it from start to finish. Pretty rough trying to pour watercolor over a 9 x 12″ surface. Difficulty also with the drying process. I used a watercolor block, and the paper took forever to dry out. I think I worked rather impatiently. Lost my contrasts and ended up with a rather dark, uniform low-contrast picture. Nevertheless I learned some things, and am anxious to pursue another fly fishing composition, hopefully sooner instead of later. Today wasn’t the best of days to try to paint. I had high school classes all day and a college class at night. Very little time to paint, and once I did, I was pretty fatigued. At any rate, I’m glad I did another watercolor, and feel that I am building some momentum. I hate long dry spells of not painting.